When fresh Tricholomopsis sulphureoides is strikingly yellow, but it soon fades to dull yellow shades. 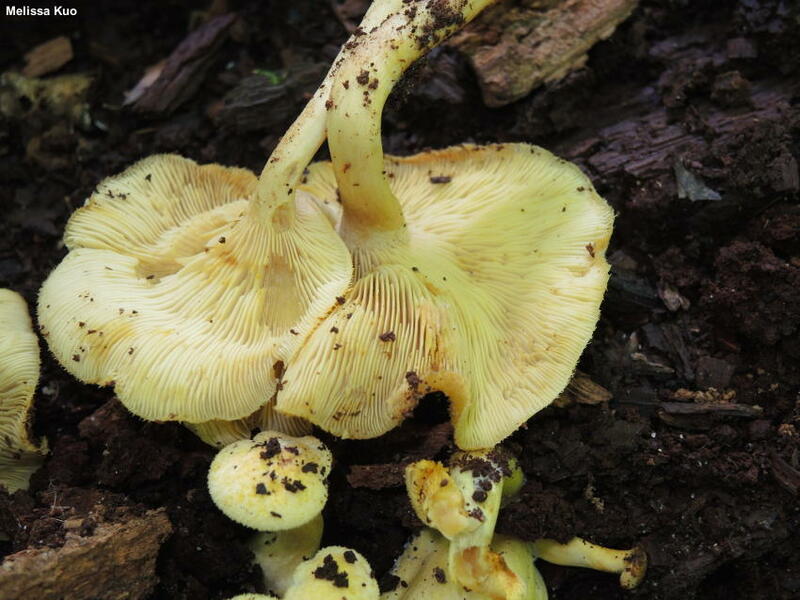 It is a wood-rotting species that appears on well-rotted conifer logs, featuring a finely scaly or fibrillose cap (the scales and fibrils are yellow), yellow gills, and a white spore print. 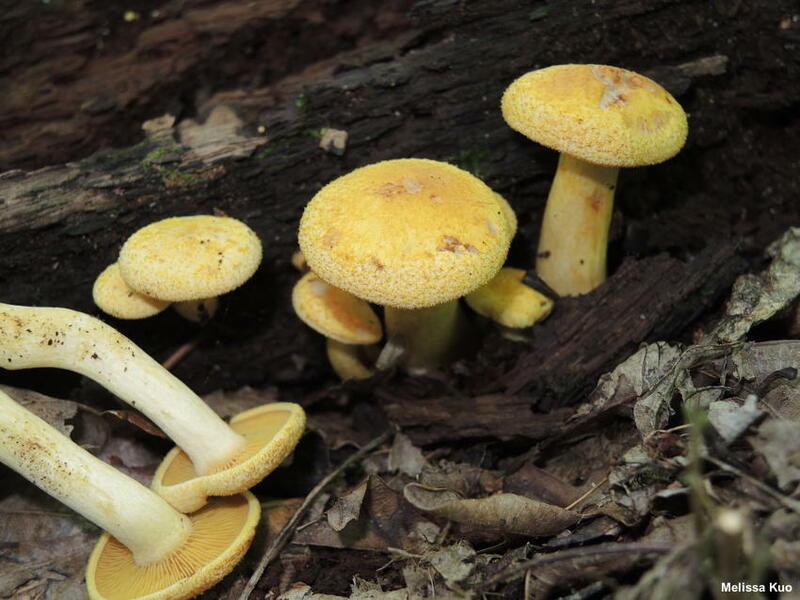 Tricholomopsis sulphureoides is more common in the Great Lakes region and the northeast, to judge from herbarium records, but it is widely reported across our continent. Tricholomopsis decora is very similar, but features tiny brown scales and larger spores. 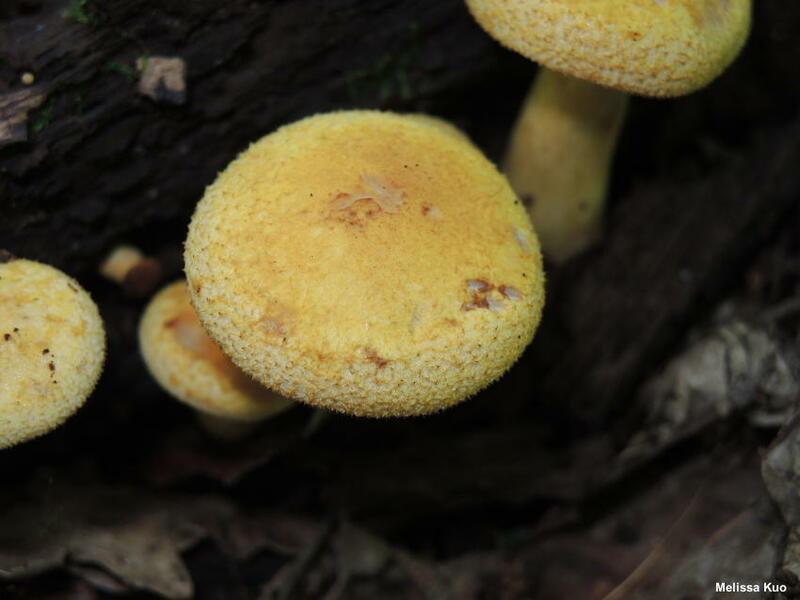 Tricholomopsis flavescens is a poorly-known, similar species with a bald cap and slightly larger spores. 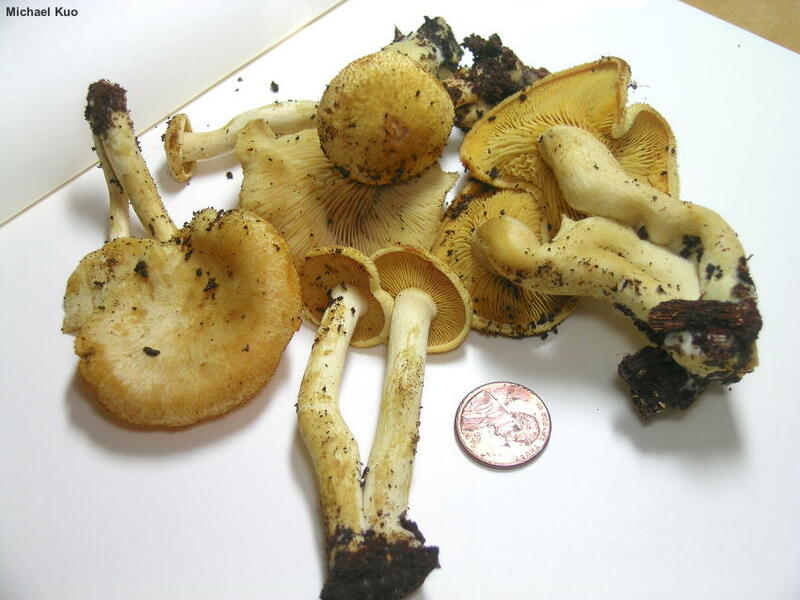 "Tricholomopsis sulfureoides" (with an F) is a spelling error made by the original author of the species (Peck, 1872), and this error is sometimes repeated in field guides and online. Ecology: Saprobic on the wood of conifers, especially hemlocks; causing a brown rot; usually growing gregariously or in clusters; summer and fall; more common in the Great Lakes region and northeastern North America than elsewhere, but occasionally reported in the Rocky Mountains, the southeastern United States, and on the West Coast. The illustrated and described collections are from Illinois and Québec. Cap: 2–6 cm; at first convex with an incurved margin, becoming broadly convex or flat; dry; subtomentose when young, becoming finely scaly to stretched-fibrillose overall, with a subtomentose marginal zone; bright yellow when fresh, but soon fading to dull yellow and developing whitish spots and streaks; bruising slightly brownish in places. 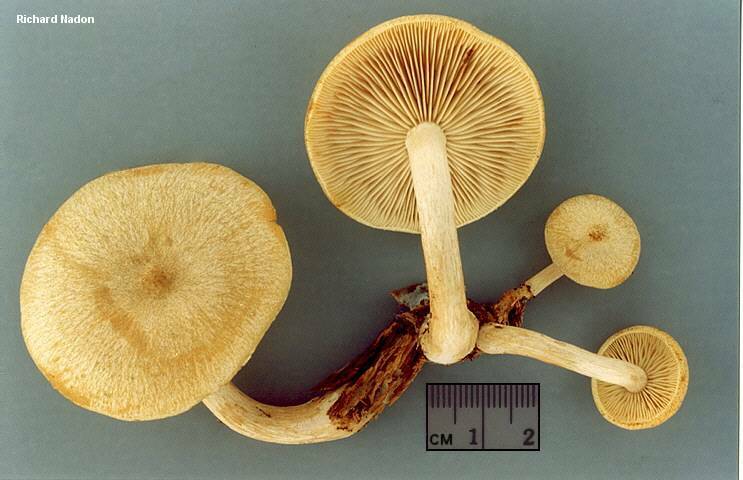 Gills: Broadly attached to the stem; close; short-gills frequent; yellow to yellowish orange. 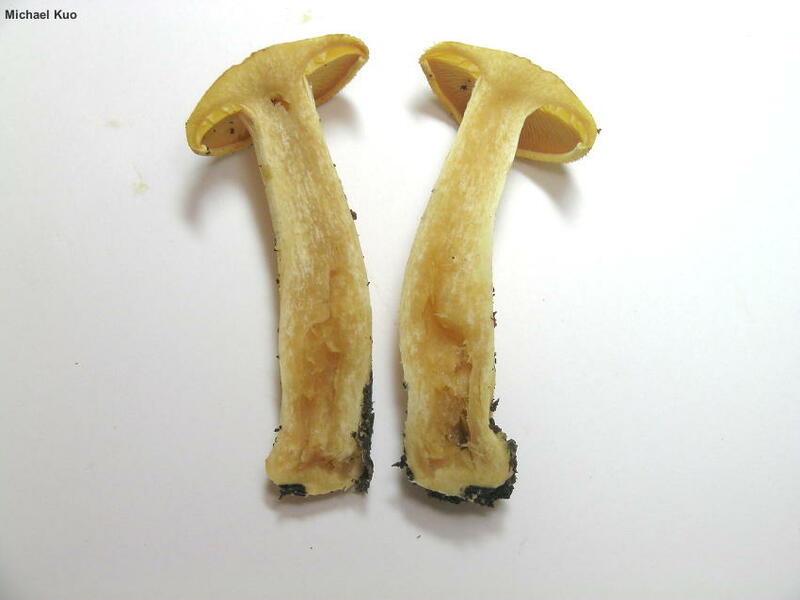 Stem: 4–8 cm long; 0.5–1 cm thick; equal; dry; slightly fibrillose in places; pale yellow, staining orangish where handled; basal mycelium pale yellow. Flesh: Yellow to pale yellow; turning slightly brownish in places when sliced. Odor and Taste: Odor fragrant; taste not distinctive. Chemical Reactions: KOH instantly dark brownish red on cap surface. 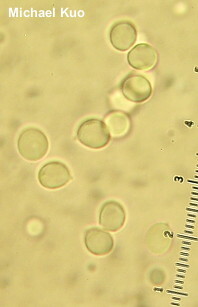 Microscopic Features: Spores 5–6 x 4–5.5 µm; subglobose to sublacrymoid, with a tiny apiculus; smooth; hyaline in KOH; inamyloid. Cheilocystidia 40–75 x 5–7.5 µm; cylindric with rounded to subclavate apices; smooth or occasionally finely encrusted; thin-walled; hyaline to orangish in KOH. Pleurocystidia not found. Lamellar trama parallel. 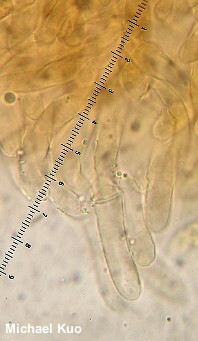 Pileipellis a cutis with aggregated upright tufts; orange-brown in KOH; elements smooth, 2.5–5 µm wide; terminal cells cylindric with rounded apices. Clamp connections present in lamellar trama and pileipellis. REFERENCES: (Peck, 1872) Singer, 1943. (Saccardo, 1887; Smith, 1960; Smith, 1975; Smith, Smith & Weber, 1979; Phillips, 1991/2005; Lincoff, 1992; McNeil, 2006; Saar & Voitk, 2015.) Herb. Kuo 07091603.